Today is not so much a travel blog. It’s a bit more personal, at least to start with. Today we disembarked at ten and struggled to find a cab. This was not because it was hot or humid – it was slightly chilly, actually, but just because they are very badly organised, which is not what you expect from New York. They have a single line of cabs to collect everybody from two ships arriving at the same time, and they are mixed with private vehicles who have come to pick up relatives disembarking the Carnival Sensation which is parked next to us. 3,000 of them and all we want to do is go to Grand Central Station. When we finally grabbed a cab – no queue, per se, just every man/woman/child for themselves, we found ourselves in stationary traffic. On a Sunday? Yes, because half the city had the roads closed for the Puerto Rican Day Parade. It took us so long to get to the station, we started to worry, and we’d allowed over an hour before the train! I’d never been to Grand Central Station. It really is a beautiful building and a marvel of 1930s architecture. 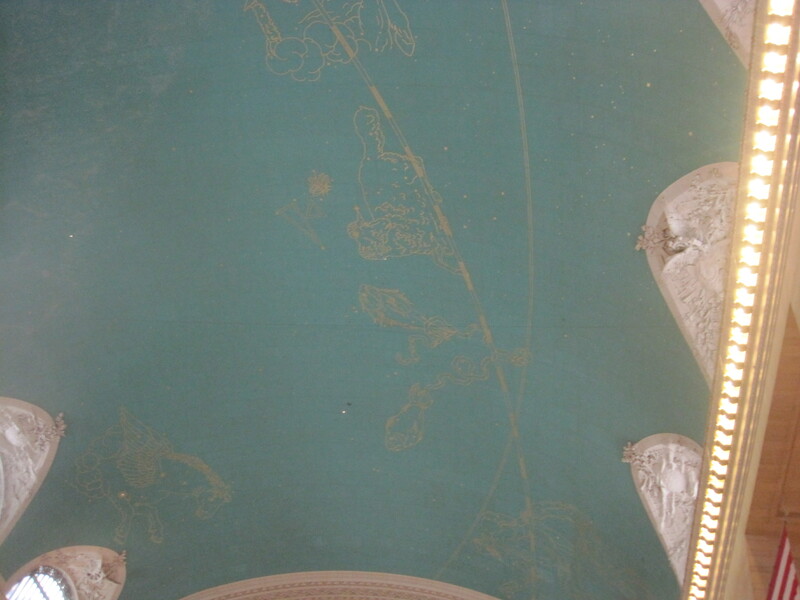 I particularly liked the paintings depicting various constellations on the ceiling of the main hall. The nice lady at the ticket counter directed us to the wrong platform, but we found the right one anyway. It was downstairs in the 100s, and it was as hot as Hell itself down on the tracks. Thank heavens the trains are air conditioned! We were on the slow train, which stopped at 16 stops in 49 minutes. Some stations were so close together that the announcements for the last station were still playing when we arrived in the next one! Bronxville looks pretty. None of the others interested us greatly. We arrived in White Plains and caught a cab to our cousin’s apartment. The cab driver tried to put another three people in our cab, to give them a lift at the same time, but we objected very strongly and we kept it to just the three of us. I’m not even sure you can fit six people in an ordinary saloon car taxi. Luckily, I had noticed a sign on the wall of the taxi rank which said that the customer has the right to exclusive use of the taxi, which I thought was odd when I read it. Good thing I did, because I was able to quote it to him when he tried to overfill ours! He said he would charge us an extra dollar for our refusal. Dad said that’s fine, there just won’t be a tip! Apparently, it’s common practice in White Plains, cos everyone is just so friendly (read: taxi drivers are so greedy). Balderdash. When we arrived, our cousins, David and Ellen, greeted us. Cousin Mary was delighted to see us but wasn’t very “with it” – she kept forgetting how we were related to her. She knew who I was, though, which was odd, as she hasn’t seen me in 20 years! I found it particularly hard when, every now and then, she apologised for not being on par – she knew she wasn’t 100%. We had a delicious lunch of cold meats and salads and homemade blueberry cake (handmade by David), and left at 3, because Mary was getting tired. David drove us back to the ship and dropped us next door so that we could go around the aircraft carrier Intrepid, next to which we are moored. Mum wanted to go over Concorde, but they close that earlier than advertised, so we missed that. Added to which, it costs twice as much as the Intrepid alone, so we won’t be doing it any time soon. Back to the ship and then out to dinner. We went to the Redeye Grill, recommended by our cousin, Suz. Superb. We were seated a bit close to the fresh shellfish on ice, so they moved us to a different table, where it wasn’t so cold! We had a large steak on the bone and a filet mignon, both with fries and salad, and divided them between the three of us. There is a sharing charge of twelve dollars fifty, but our waiter didn’t charge us. We then had a sort of strawberry pavlova type dessert, with chocolate straws and chocolate sauce – one between the three of us. When the bill came, we found there were no drinks on it at all! We didn’t complain… A man at the table next to us had a birthday, and it sounded like one of the waiters has operatic training, because the singing of “Happy Birthday” over the sparkler in his dessert was rather impressive! 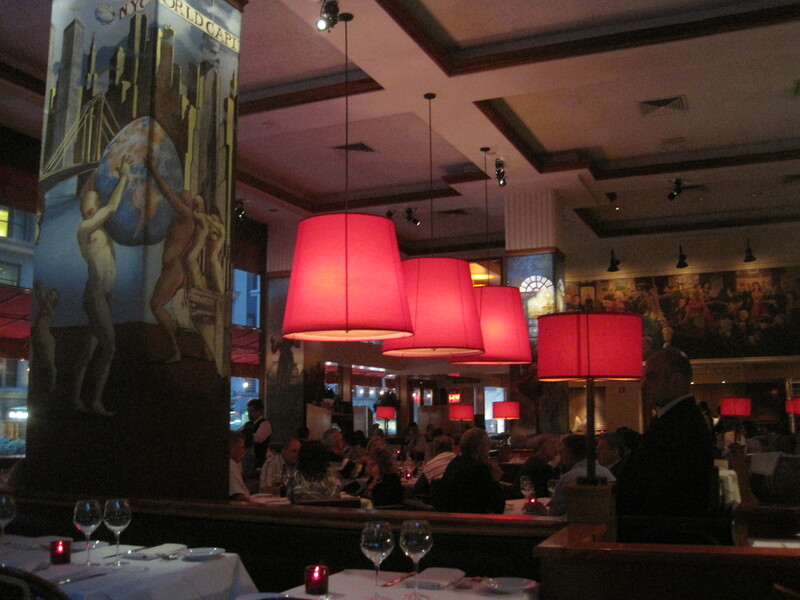 Overall, it was a wonderful meal, thoroughly delicious. Not cheap, but not extortionate. Highly recommended. Get there early or book ahead. There are about six steps to climb to get to the restaurant.